Being yourself can change your life. Obviously, it isn’t groundbreaking to know that I am from Hawaiʻi. We willingly share basic facts about ourselves when we meet new people, and we expect our close friends to internalize those details by the time we graduate. My core group of friends know that I live on Oʻahu, and I know they live in New Mexico, Texas, Massachusetts, Washington D.C., North Dakota, New Jersey, New York — and yes, Hawaiʻi. However, I’d like to think that the staff writer was alluding to a more profound understanding of my identity. Sometimes I think that my peers remember where I’m from because it’s so far — and different — from Hanover, New Hampshire. Or perhaps it’s because I’m one of the few students from Hawaiʻi that they met. More often than not, it’s certainly true that people remember this fact because I made it difficult for them to forget. I have stickers that read “Hawaiʻi” on my laptop, my social media posts usually have some connection to my home and two of my closest friends are also from Hawaiʻi. This is a fact about myself that I wanted people at Dartmouth to know, not just because of the love I feel for my home land but because of the pride I feel as a Native Hawaiian. In the past four years, I have had the privilege of witnessing the growth of the Native Hawaiian community at Dartmouth and laughed when people call us out for being “exclusive” or “clique-y.” I have seen the increase in membership in pictures from the Hawaiʻi Club’s annual spring lūʻau. I have watched Native Hawaiians rectify their roles as indigenous change-makers on a predominantly white campus. I have empathized with their disappointment when learning how little people know about Hawaiian history and culture. I have felt their homesickness and their yearning to return to their home, if only to feel the warm sun on their face and sand between their toes. Most importantly, I have witnessed their perseverance. Their love for their people. Their determination to educate others on this campus and return home to make a difference. Coming to Dartmouth has surprisingly helped me learned what it meant and what is at stake when I tell someone, “I am a Native Hawaiian.” It goes beyond race or ethnicity. To invoke one’s identity as “Hawaiian” is to assert a claim to the histories of a strong people, past, present and future. It is to form communal bonds and perpetuate hope for future generations. I know this realization may not be the most profound explanation of someone’s Dartmouth experience, but it is one that I have accepted and one that I know other indigenous people have as well. My education here has not only given me a greater appreciation for my home, but also shaped the way I view power dynamics, privilege, colonialism and multiculturalism in Hawaiʻi and the higher education system. I recently completed a survey for a friend on the ways in which Hawaiian identity has impacted my time at Dartmouth. When asked about the spaces to which I gravitated most, I informed her that they were often spaces with a high density of Hawaiians, indigenous people or people of color. When she asked me for advice for future Native Hawaiian students, I told her that they should not be sure to lean on the Hawaiian and indigenous communities whenever they experience stress or sadness. As future leaders, they should also not be afraid to be critical of this institution — just like Hawaiʻi, Dartmouth is not a paradise. Looking back on my responses, I am less convinced that the staff writer solely meant that people only know me as someone from Hawaiʻi. I’d like to think that he was alluding to a spirit of community and activism that has come to define the Native Hawaiian presence at Dartmouth. But perhaps I’m reading too much into the statement. Regardless, I look forward to living up to its sentiment in the moments leading up to Commencement. I am sure that students will comment that I am their friend from Hawaiʻi, and I will view this as an opportunity to share a little bit of my identity as a Native Hawaiian. On the other hand, I may not get as much of an opportunity to do so, because once again, I am showing up late to campus for Commencement in true Kourtney fashion. 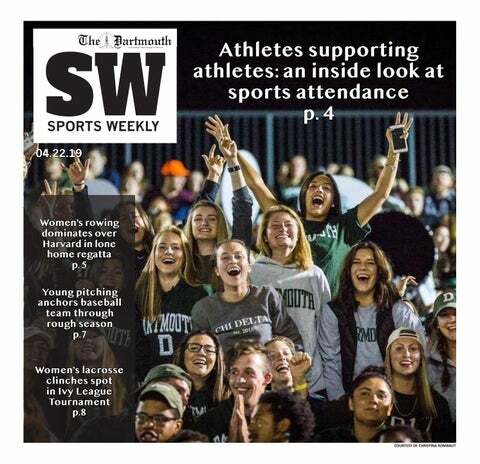 Kourtney Kawano ’18 is the former production executive editor of The Dartmouth.